Powered by Microsoft Windows Storage Server 2012, WSA-2000 Series storage appliance provide low cost, multi-protocol IP connectivity for concurrent NAS (SMB and NFS) and iSCSI SANs. It is a standalone network storage solution with single storage controller head (SCH) and built-in SSD/HDD disks, external SAS ports for DAE JBOD expansion. It gives you automated, application-ready storage that provides complete consolidation of all of IP storage needs of a small business or a branch office. 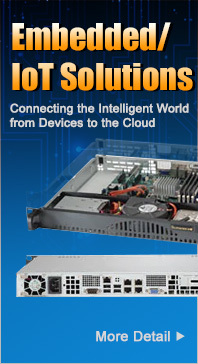 Powered by Microsoft Windows Storage Server 2012, WCA-4000 Series storage appliance provide low cost, multi-protocol IP connectivity for concurrent NAS (SMB and NFS) and iSCSI SANs. It is a standalone network storage solution with dual storage controller head (SCH) cluster-in-a-box and built-in all flash SSD disks, external SAS ports for DAE JBOD expansion. It gives you automated, application-ready storage that provides high-performance for highly virtualized workload requirements of small-mid size enterprises. IRON WMX 5000 Series systems contains two or four WMX Storage Controller Heads (SCH) and provides the complete active-active foundation for Enterprise class high-availability storage array. It is available in configurations supporting up to four Storage Controller Heads (SCH), with a maximum of 8 front-end 40/56GbE LAN ports and 64 SAS2 6Gbps ports supporting up to 240 drives. IRON WMX 6200 Series systems contains two or more (max 4) WMX Storage Controller Heads (SCH) and provides the complete active-active foundation for Enterprise class high-availability storage array. It is available in configurations supporting up to four Storage Controller Heads (SCH), with a maximum of 8 front-end 40/56GbE LAN ports and 64 SAS2 6Gbps ports supporting up to 240 drives. IRON Disk Array Enclosure (DAE) family of JBOD (with pre-populated drives) solution provides simple, easy ways to dramatically grow online disk capacity to meet exponential data growth rates. It enables massive data capacity applications, at a price/performance point per Gigabyte (GB) that meets your fast-moving business requirements. 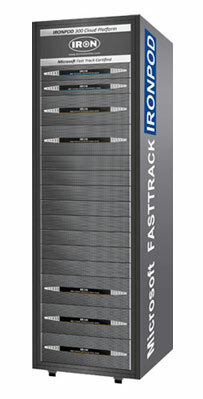 IRON offers a full range of low-cost, high-capacity, high-performance disk drives (HDDs) and ultra-high-performance solid-state drives (SSDs) configuration options that lets you optimize any of the DAE for capacity, performance or versatility. 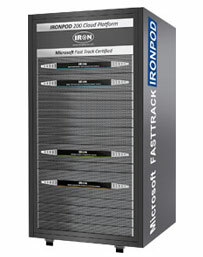 IronPOD™ Turnkey 300 System is a 24U or 42U self-contained converged Infrastructure-in-a-Box; it is available as a pre-configured single rack IaaS POD. 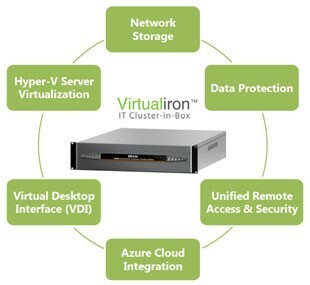 IronPOD 300 Systems are built using standardized hardware building blocks and Microsoft Windows powered network, compute and storage virtualization technologies. Everything you need is provided in one single SKU package, including Microsoft Windows Server 2012 and Microsoft Windows System Center Manager Software. It is delivered ready-to-run pre-validated, pre-tested, pre-cabled, pre-racked to help you accelerate your custom private cloud or specific business application configurations deployment in as little as 30 days from your order.